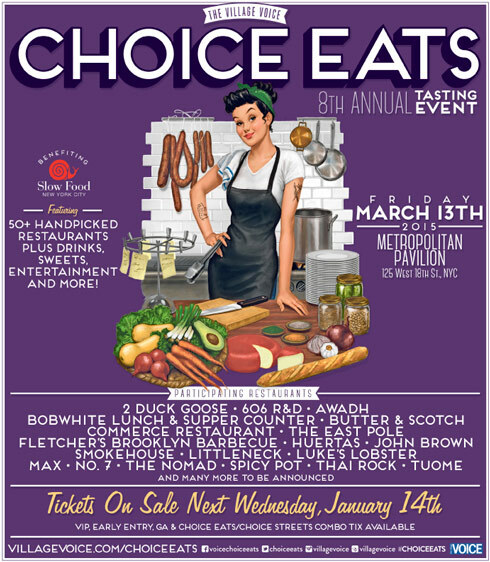 The Village Voice will host its eighth annual Choice Eats tasting event on Friday, March 13th at the Metropolitan Pavilion in Chelsea. The event will feature an array of over 50 handpicked restaurants from all five New York City boroughs. Throughout the evening, guests will enjoy unlimited sampling of the best dishes from the restaurants along with desserts, complimentary craft beer pairings, wine and liquor beverages. Participating restaurants include 2 Duck Goose, 606 R&D, Awadh, Bobwhite Lunch & Supper Counter, Butter & Scotch, Commerce Restaurant, The East Pole, Fletcher’s Brooklyn Barbecue, Huertas, John Brown Smokehouse, Littleneck, Luke’s Lobster, MAX , No. 7, The NoMad , Spicy Pot, Thai Rock, Tuome and more. Portions of the proceeds will go to Slow Food NYC, a non-profit organization that promotes efforts towards a good, clean, and fair food system.